Microsoft released the October 2018 Update yesterday on the November 2018 Patch Tuesday; while the update was delayed quite a bit because of issues that were not detected in time before it was published briefly on Windows Update, work on the next feature update continued unhindered in the six weeks that Microsoft needed to sort things out. The first feature update for Windows 10 in 2019 may feature search changes. May, because things are still under development and it is possible that Microsoft will throw them overboard entirely or change them before the first feature update of 2019 is released globally. You can see some of these changes already when you run a recent Insider build of Windows 10. Basically, what Microsoft considers for the new feature update, is to separate Cortana more from Search. Cortana won't go away, however, and is still used when it comes to voice search functionality. Search itself continues to search local and Internet content by default. Tip: you can disable web search in Windows 10 easily. A click on the search field of the taskbar in a recent Insider build of Windows 10 displays a new search interface and next to it an option to open Cortana for voice searches and other activity. 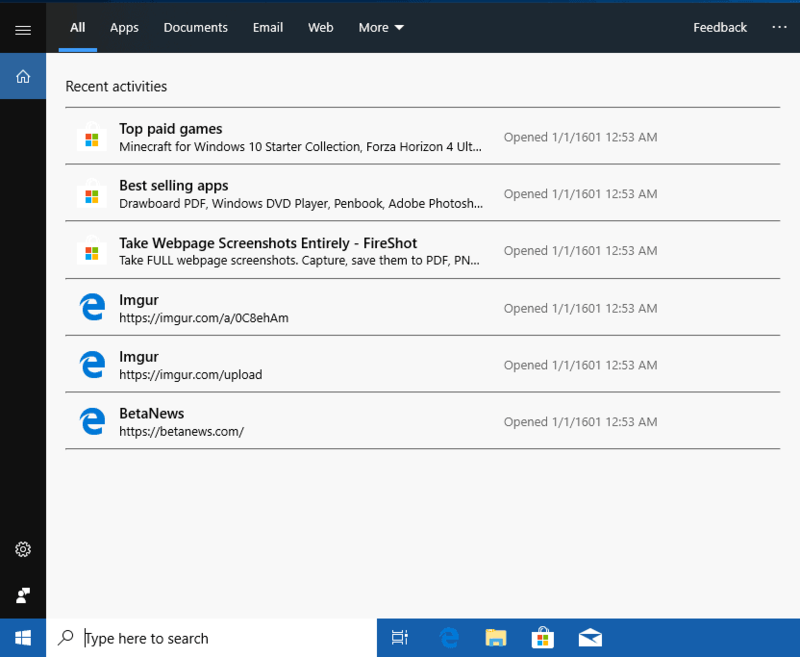 The interface itself replicates the search interface of Windows 10 version 1809 for now; the list of recent activity is displayed when you activate search. The filters at the top, to display only programs, documents, or web results among other things, are displayed right away in the new version. A click on the menu displays a link to the indexing options to manage Windows Search locations or unlock global search indexing, a new option that Microsoft calls enhanced search mode that was added recently. A right-click on the taskbar of the operating system displays a new Cortana menu (previously named Search). You may use it to switch between the search field and Cortana icon, and to hide the entire search field in the taskbar. Search functionality is available in the Start menu as well. Just activate Start and start typing to run a search on the system. Microsoft improved search quite a bit in recent versions of Windows 10 but it is still basic when compared to third-party search tools especially if you are looking for specific files. Programs like Wizfile or Everything are faster, offer better options and better when it comes to finding files on the system. The first feature update for Windows 10 in 2019 may feature search changes, and here especially a separation between Cortana and Search. 1. Did Microsoft fix the bug that prevented Web search from being disabled in 1803? 2. Do programs like WizFile and Everything also search the control panel and the settings app? I have to test 1), can’t say as I don’t use web search. The search tools find files only. That’s too bad. I don’t want Web search integrated with local search. If there were a program that searched the settings app and the control panel, then I could replace Windows search entirely, and not have to worry about Microsoft breaking their own settings and having to resort to registry hacks to disable Web search. I cant even burn 1809 because microsoft is so stupid they made the iso slightly bigger than a dvd and I dont have any dual layers and I aint going to go buy some, they are the zenith of inept. Use Rufus instead to create bootable USB drives. No installation required. Would be nice if Microsoft just got basic search right with local searches. I could care less about Cortana because for the web I use other search tools. Should have options to just remove Cortana completely and revert to a basic local search. It really should have always been that way for every Windows 10 version. I use a (couple of) third party search programs. Windows search remains absolutely worthless to me. It is never able to find what I’m searching for, so I don’t use it. Seriously, Windows 7 search was pretty poor, but it was absolutely wonderful compared to what came after. The idea of web searches through FILE Explorer is crazy. I want FILE Explorer to find stuff in my computer. I want a browser to find stuff outside of my computer. Difficult to understand? No. Letting Explorer escape into the wild does give MS the opportunity to annoy you with Bing (which everyone I know closes instantly) and meld your files with collection of your online session data. This is Microsoft’s way of driving traffic to Bing Bong. outlook search is something needing to be improved i feel – anyone know a good one? so if I am installing the latest windows 10 on someones device, I like to give them media so they can do it themselves in the future. So i am supposed to pay for usb sticks to give away instead of 10 cent dvds?